As shale gas policy in New York nears completion, key agencies are sending very different signals about the state's ability to handle impacts from high volume hydraulic fracturing. Leaders within the Mineral Resources Division of the DEC – the state’s permitting arm for mineral extraction -- continue to advocate shale gas development while downplaying its risks. A collection of county health officials, on the other hand, have issued a report warning of a lack of resources and knowledge to protect the public from dangers associated the kind of unconventional practices, including high volume hydraulic fracturing, necessary to produce gas from bedrock. They are calling for a comprehensive, independent report to assess and deal with health risks before the state begins issuing permits. Meanwhile, DEC officials are facing mounting criticism for sharing drafts of policy to oversee drilling operations with industry lawyers before making them public. Critics claim the industry unfairly used inside information from the DEC to lobby for changes to regulations prior to their public release. The coalition of activists and government watchdog groups have scheduled a rally and press conference on the New York City Hall steps Tuesday at 12 p.m. In reassuring the public that shale gas development is safe and beneficial, officials within the DEC’s Mineral Resources Division have publicly denied that hydraulic fracturing uses dangerous chemicals. “The drilling companies in our area do not use the toxic fluids mentioned at the Waxman committee hearings (on the contents of fracking fluid),” Jack Dahl, director of the DEC’s Bureau of Gas and Oil Regulation, told The River Reporter’s Tom Kane in 2008. “The companies we talked to said that they use only water and sand.” Mineral resources staff gave similar assessments at public meetings to educate people about Shale Gas development in 2008 and 2009. 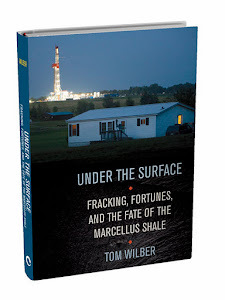 Their message then: Shale gas drilling and fracking – the controversial method to extract gas from rock by injecting the well bore with a pressurized chemical solution -- would look no different than conventional development. Due to a “well established regulatory program“ and a “rigorous permitting process” of the agency, impacts from shale gas development would be minimal or environmentally beneficial over the long haul, according to this agency line. As DEC staff made these public reassurances in 2008 (documented in my book, Under the Surface), the Mineral Resources Division worked with industry representatives to craft a bill that would facilitate the permitting of unconventional shale drilling units, which at the time could not be easily adapted under permitting for the much smaller units designed for conventional wells. With the DEC’s endorsement, the highly technical bill passed easily in both the Senate and the Assembly, although permitting was halted at the last minute under Gov. David Paterson’s administration pending an environmental review. While the exact contents of fracking recipes are proprietary, industry records and the state’s permitting policy document (the Supplemental Generic Environmental Impact Statement now in draft form) show fracking solutions contain hundreds of toxic chemicals including solvents, acids, and glycols, exposure to which can cause health problems ranging from cancer to brain damage. Libous, who also sits on the governor’s panel, said through his spokesman Emmanuel Priest that the panel would review the report, but he did not elaborate on its significance. You know, I WANNA believe that we can trust in the regulations set up for fracking, but I just don't. I can't.